Tell me a bit more about the start of your business. Why did you choose Christmas trees as diversification, and was the start of your new venture smooth or scary?! During 2001 as outdoor pig farmers our business was very badly affected financially by the foot and mouth outbreak and we vowed that we would not just be dependent on one enterprise again. We had some odd corners of fields that weren’t very useful, so we decided to plant them with Christmas trees as we thought they would be easy to grow! Several years later we have realised that there is a lot more involved in growing a quality tree and that it takes 8-10 years for them to be large enough to sell! However, we started by selling small numbers of other local growers trees and have slowly grown the business over the intervening period where we now grow 25 acres of trees ourselves . 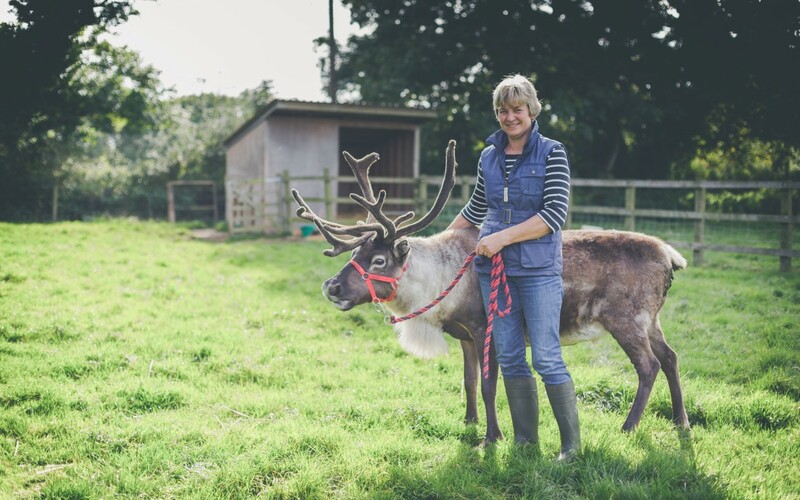 We bought our first two reindeer in 2008 and these magical creatures have been a very popular addition to our farm experience. You mention you have a voucher system for local schools - can you explain how that works? We are a small, family, local farming business and are therefore able to provide a special, personal level of service which our customers value. We put a lot of effort into looking after the trees throughout the year to ensure we have quality trees for Christmas. The fact that trees are locally grown in East Devon means that they have not had to be shipped from other parts of the country or from Europe. The trees can therefore be freshly cut to ensure they last well over the Christmas period. We also think it’s great that our customers like to support a local farming business, especially at the moment when we are struggling with low prices in other enterprises. Have you noticed any fluctuation in sales of real trees? Do you think they are growing in popularity again or is the convenience of fake trees always a threat? Our fresh tree sales have grown year on year and many of our customers have been coming to us for a long time. Many people have had a bad experience with a fresh tree that does not last until Christmas, as they have been cut so early. Once people know that they can trust their source for a good quality tree which will last, they come back again & again. A fresh tree is more environmentally friendly than an artificial tree especially as a new tree is planted to replace each tree that is harvested. It’s also part of the magic of Christmas to bring a real tree into the house - plus they smell great too! Tell me about why you choose to support Send A Cow? As farmers ourselves, we have felt a special connection with ‘Send a Cow’, a charity working in east Africa to empower very poor farmers to help themselves out of poverty. We have supported them at Christmas for several years, selling delicious cakes, providing free mulled wine and mince pies at weekends and not charging for admission, instead asking you for donations towards this effective charity. Finally, please can you explain how the Click and Collect option works? We came up with the idea of offering a click and collect service for our Christmas trees to allow busy working people, who might not have time to visit our farm, to still be able to access a locally grown quality Christmas tree easily. Just go to the website www.cotleychristmas.co.uk and select click & collect from the menu. This takes you to our shop area where you can then choose to buy Christmas trees, wreaths, hampers or order a turkey. If you want a Christmas tree you select the variety you want, then the height and then select a date & site for collection . Payment is taken via Paypal. We have two sites; one at Cotley Farm and the other in Exeter at Matford. The opening hours are shown for each collection site. We require 3 days notice of the collection date because for Norway Spruce & Nordman trees we will cut the trees to order ensuring you have the freshest tree possible. To collect your tree please bring your e-mail receipt with you when you collect your tree from the site and on the day you have selected. We will have preselected a tree for you which will be netted for ease of transport. If you wish to inspect it before taking it away, the tree can be opened and then re-netted after you have looked at it to confirm it is to your requirements. We will supply an alternative if you do not like it. Turkeys: Please select the type of turkey and weight you require. We are unable to give the exact price for your turkey until collection. This is because they are a natural product and we cannot guarantee the exact weight until they are prepared for Christmas. We will always endeavour to get the weight as close as possible to that which you choose. We therefore take a deposit of £20 now and the rest of the payment is made on collection. Turkeys can only be collected from our Cotley Farm site at Whimple 10.00am - 6.00pm on Wednesday 23rd December or before 12.00pm on Christmas Eve.